FOOTBALL FOR ALL is a unique section of the Irish soccer community that holds a special place in the heart of DBSportsTours and we want to invite you to help us help anybody you know that can benefit from it. The Football Association of Ireland was the first sports governing body in Ireland to appoint a national co-coordinator to begin a Football For All programme and we have combined with the FAI to offer a once in a lifetime opportunity. Numerous agencies and groups nationally recognize how football can play a positive role in the lives of children with disabilities. We couldn’t agree more and DBSportsTours managing director David Berber should know – he has worked with Lourdes Celtic’s Football For All section. “The first time I went down to get involved with the Football For All programme at Lourdes I was almost in tears. “It really does pull at your heartstrings because parents will come back to you and tell you that the players are able to go into school on a Monday morning and talk about scoring a goal on the Saturday like every other kid can. “Whether it is Dyspraxia – which 90 per cent of the kids going over to Manchester have, or Down Syndrome or Autism, these children have enough to work against in life without being denied the opportunity to do something they love like playing football. In August 2011 35 young players with disabilities from Lourdes Celtic had their dreams come true when they became Manchester United players for a weekend. DBSportsTours in association with Dyspraxia Ireland, sent the Dublin club’s Football For All programme to enjoy a memorable two days behind the scenes at the Premier League giants. The group that mainly consisted of children with Dyspraxia, also included youngsters with Autism and Down Syndrome. Fully funded by a Liverpool and Manchester United Legends Golf Classic at the Kclub in June – with the likes of former Ireland stars John Aldridge, Jason McAteer and Ronnie Whelan in attendance. 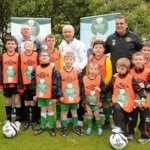 The Lourdes Celtic Football For All programme brings children with disabilities together one day a week and gives them the opportunity to enjoy football in an environment suitable for their condition. DBSportsTours wanted to take the idea one step further and bring the children on a life-changing group trip they may otherwise never experience. After watching the group train with Manchester United coaches, take a tour of Old Trafford and watch a live Premier League game at Ewood Park, Berber admitted the trip was everything he hoped it would be. “It was actually incredible the change in these kids just at the end of a two-day period. “Once we got to Manchester we split the kids onto one bus and parents on to another and that was a big deal. “These are kid who never leave their parents’ side and by the end of one weekend they didn’t want to be around their parents at all they were having so much fun. Arriving in Manchester on the Friday, the children enjoyed an evening training session with disability coaches from United’s academy at the club’s famous training facility at the Cliff. The group was split into four sections by the coaches so that each player’s motor skills and disability was individually catered for during the co-ordination and balance drills put on. On the Saturday the children were shown around the famous surroundings of Old Trafford, before United threw a birthday party in honor of one of the kids at the famous ground and than the group traveled to watch the Premier League clash of Blackburn and Everton. Next year we want to go even bigger and better but this time we are opening the opportunity up to every club and in association with the FAI we are holding a Charity Football For All Xmas Ball at the end of the month. One of the numerous special guests present on the night will make the national draw to decide which club will travel to one of the world’s biggest clubs. November 24 is big night and we are encouraging everyone to not only join us on the night but make sure your club’s Football For All section is included in the draw.